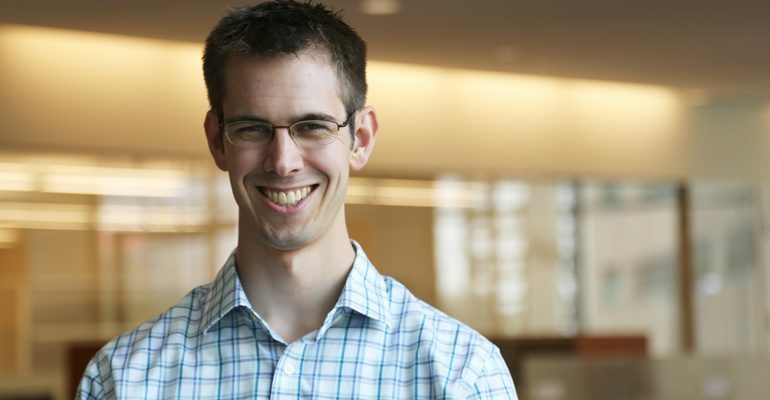 Gitter, a new UW-Madison assistant professor of biostatistics and medical informatics and Morgridge Institute for Research investigator, studies the interconnected relationships in biological functions. Gitter says his work often looks at how multiple genes or pathways — each of which could be unimportant alone — might be very important to a disease process when working together. “Everything I do is framed in networks and pathways, and I want to understand whether there is something important in the less frequent ‘other’ and start to look for interesting signals,” Gitter says. Gitter’s statistical principles are being put to work in the Morgridge virology focus area led by Paul Ahlquist. It’s a particularly rich area for this type of networked analysis, since viruses use a complex symphony of actions to invade cells, hijack their functions and continue to infect. During his PhD work at Carnegie Mellon University, Gitter developed a network model that helps explain what’s taking place during the early cellular response to viral infection, including what proteins are in play, what messages are passed and what genes are turned on and off. This work will continue at Morgridge, which has a large bank of data on genetic function of viruses. Gitter came from a nontraditional postdoctoral experience that included an assignment with Microsoft Research in addition to the Massachusetts Institute of Technology. That academic-private relationship worked well and was a deciding factor in choosing UW-Madison, with the private Morgridge connection. The commitment to basic research questions seems especially strong here, he says. Gitter’s biological work began with the model organism yeast, which is well-researched and its cellular pathways have been highly defined. As more and more human network and disease data came online, Gitter ventured into virology and cancer research. In his cancer work, Gitter has focused on how the same type of cancer can look very different when manifested in individual patients. With the potential for personalized medicine and the plummeting cost of whole genome sequencing, it will be important to address the heterogeneous nature of cancer, along with the common bank of knowledge on the disease. Being part of a computational team addressing human health issues, Gitter is motivated by “moving the needle in two different ways.” One outcome is creating an ingenious method on the computational side to assemble and analyze data in ways previously impossible. On the biological side, he can work to make better predictions of what groupings of genes might play an important role in the path of disease.